One of the UK’s largest exhibition venues is celebrating a flying start to 2015. ExCeL London has already welcomed thousands of exhibitors and visitors through its doors in 2015 for the London Boat Show, The Telegraph Cruise Show and the debut London Classic Car Show. Now in its 11th year at ExCeL London, the London Boat Show achieved a 4% visitor increase, with 92,000 people attending. Returning for its second year, the Telegraph Cruise Show reported a 91% increase in exhibition stands. The first ever Classic Car Show welcomed over 25,000 visitors over its three days. 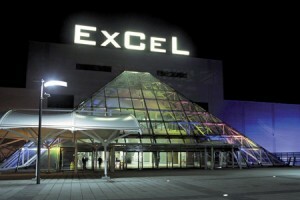 If your organisation is thinking of exhibiting at ExCeL London in 2015, contact 200m2 on 020 333 200 92 to discuss your ideas. From exhibition stand hire to a fully managed service, 200m2 is one of the most experienced exhibition stand contractors in the UK. Going to Exhibitions Outside of your Trade – What are the Benefits? Easy to build and extremely lightweight. The most portable exhibition stand system. The most popular modular exhibition stand system. Made from aluminium and composite. Foldable exhibition trussing which can be adapted to suit any floor space or height. Transport your exhibition stand equipment safely with our unique collapsable flight cases. "4 Cancer Group is a cancer respite charity with a sporting focus. Consequently, we have a wide range of exhibition and event needs across a large number of different sports. 200m2 has helped us to obtain value in an area where we were being overcharged in the past. With an an adaptable stand and replaceable graphics, our events are now easy to manage." "We have worked with 200m² Exhibitions on a number of occasions and always found them to be very helpful, professional and great value for money. At our Volunteer conference in Oxford the guys loaned us some fantastic banner display stands that really set off the conference. As well as providing the stands and banners they also gave up their free time to assist with the build and breakdown. Great work, thank you!" "FIS is the world’s largest global provider of banking and payments technologies. Consequently, global exhibitions and conferences are a major part of our marketing strategy. We contacted 200m2 to assist us with an exhibition in the Middle East. It was clear to us that these guys knew what we were looking for. Since the show in the Middle East, 200m2 has taken responsibility for our other exhibitions around the world. As exhibition stand contractors, we have found 200m2′s service, products, customer care and value for money to be of the highest order"
"From project scope to final design outcome, the process could not have been more professional. At many events we are a ‘platinum sponsor’ where the level of expectation from the event organiser is exceptionally high. On each occasion the stand has been in use, we have received very positive feedback and requests to re-exhibit at future events. From our perspective, we have nothing but praise for 200m2 and look forward to many more successful exhibitions." "As part of a conference at Canary Wharf in London, 200m2 delivered a full blown stage and seven separate exhibition stands where various OEM’s could display their products. 200m² Exhibitions played a critical role working with us to develop a solution and handled the ever changing dynamics with true professionalism. I would estimate that we had over 30 different layouts which were all drawn up and laid out in CAD for approval. Great job 200m² – we will be using you again!" "Portrait Photography is highly competitive. It is vital for us to show our products in the best possible light. The CROSSwire system definitely meets our requirements and together we managed to develop a bespoke hanging system for our portfolio. This was a challenging objective which could not be met by a straightforward off the shelf product. All in all I am very satisfied with the product but also the professional approach of 200m² Exhibitions." Rory Hitchens - Senior Marketing Manager.